Biscuit is using Smore newsletters to spread the word online. The Urinary System is composed of many organs and is an essential for getting rid of waste in both the liquids you drink and your blood stream. The urinary system is also connected with other organs to help them and them to help it. The excretory system has one main task and that is to get nutrients from the water you drink and then remove the waste. It then turns those chemicals into what we call Urine and is sent to the outside of the body. It also sends messages to the brain letting it know when to release the urine. Kidneys remove Urea/Waste as a by product of protein digestion. 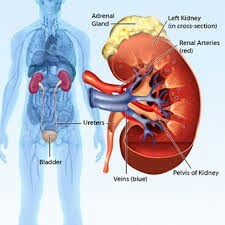 The kidneys are working with the Circulatory system (blood stream) in doing so because the urea is in the blood. When the kidneys finish "purifying" the blood it sends it back into the blood stream. Kidneys are also tied with the Endocrine System (hormonal system) and the adrenal glands are on top of the kidney. The hormonal system also helps monitor the kidneys fluid levels for them to keep functioning. The Urethra are tubes connecting the kidney to the bladder allowing fluid to be transported. The Urinary Bladder is where the urine is stored and eventually released. The Muscular system is what works with the excretory system because muscles and needed in order to allow urine to be released from the body. There are quite a few diseases associated with the urinary system. Bladder cancer found in 75,000 Americans each year (mainly men and the elderly). The symptoms include urgent/difficult urination along with pain in the pelvic area and back. Another disease is Urinary infection. This occurs when bacteria gets in the tract (or tubes) and then it harms the organs. One of the most common problem is kidney stones. Kidney stones result from a chemical (calcium oxalate) is formed when urine gets concentrated to the point of becoming solid. This then causes pains in the back and side as well as blood in urine. In conclusion the excretory system is one of the most important bodily systems. It removes waste, makes our blood stay clean and is helpful towards the hormonal system by giving it the adrenal glands a place to be.